Photo Writing - Exploring Photography. : Photo Mechanic special! Photo Writing is the web version of the Photo Writing mini-magazine produced by Limephoto and Emil von Maltitz since 2010. As of 2015 it is now completely online. Feel free to browse through the articles and please leave comments in the comments section if you would like to engage with us. Long Story short: Camera Bits are offering Photo Mechanic 4.6 at a reduced price of $60 for a limited period as a birthday promotion (they are 15years old). Is it worth it? Yes! Read on for more. For a while I have been trying to adjust my DAM workflow to try an speed things up (always a problem and always a necessity) when working with large numbers of images. I really like using Capture NX2 and Nikon software that embeds information into the RAW files. The problem is the snail like pace with which Nikon View and Capture work. Although speed isn't as bad as a few years back (I used to be able to go and make a cup of coffee while working on Nikon Scan and importing a single image. Needless to say I drank a lot of coffee), it still causes hair tearing frustration at times. 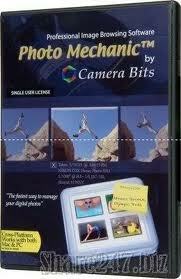 So Photo Mechanic has always seemed interesting to me from the various reports floating about on the web. The ability to embed IPTC data was particularly attractive (as in Nikon's proprietary software). The problem was the hefty price-tag of US$150. This was a touch steep for a South African and for just an initial edit and workflow programme (you still need an editing suite as this is just for sorting, naming, and playing with XMP and IPTC data). Camera Bits are offering the Photo Mechanic Software for a limited period special of $60 as a birthday promotion. This prompted me to try out the programme. Within the hour I had changed the demo to a bought copy. Compared to View the software flies. There more information and it works seamlessly with Capture NX2. Sadly NX2 is still as slow as ever but Photo Mechanics speeds up the overall workflow so the NX2 speed blues aren't quite as annoying.One brilliant feature is the ability to export TIFFs from NEFs directly from PM with the adjustments made in NX2. Brilliant! If you work with lots of RAW files and are a Nikon user it is definitely worth trying out Photo Mechanic. I can't say the same for Canon users but by all accounts it should be as effective. Interview with Myllo Menorah - A photographer's photographer! Drakensberg Workshop and a note on Whether or not to go pro. Photo Writings ebook now availlable.